My husband and I both grew up watching The Flintstones--and love sharing some of our favorite childhood cartoon characters with our girls. We were probably more excited than the kids to recently review The Flintstones & WWE: Stone Age SmackDown--a new movie featuring our favorite stone age families and the prehistoric likenesses of some familiar WWE Wrestlers. Join us as we share this fun, new, animated, family movie--and enter to win copy of your very own in the giveaway at the end of this post! We received a complimentary review copy of this movie. All opinions and experiences are our own. Quick Summary of The Flintstones & WWE: Stone Age SmackDown Movie. When Fred loses his family's vacation money, he hatches one of his hair brained plans to get it back. It's a sports entertainment spectacle that involves throwing his best bud, Barney into the wrestling ring with the likes of John Cenastone (John Cena), Rey Mysteriopal (Rey Mysterio) and even The Undertaker, with Fred himself as event promoter! The crowds roar, the "clams" are pouring in from ticket sales and even Mr. McMagma (Vince McMahon) is taking notice of all the hoopla. Including all-star appearances from The Boulder Twins (Brie and Nikki Bella) Marble Henry (Mark Henry) and Daniel Bry-Rock (Daniel Bryan), it's time to get the whole family together for hard-hitting, side-splitting laughs from the most epic event in all of prehistory! The Flintstones & WWE: Stone Age SmackDown! brings family friendly smiles. In the traditional, slapstick humor of the original Flintstones--Fred gets into trouble and enlists his pal Barney to help him out. It's a really cute, family friendly movie with familiar WWE wrestlers, downplayed fight scenes and both kid friendly humor--and puns for the adults too. It's a fun way for parents to share both comedy of the Flintstones with the action and personalities of the WWE. While families will enjoy the movie's nostalgia--modern families will want the app too! What can you do with the interactive app above? Take the quiz and see which The Flintstones & WWE: Stone Age SmackDown character you are! Download the Stone Age Activities to do while watching the film! Check out the official movie trailer! 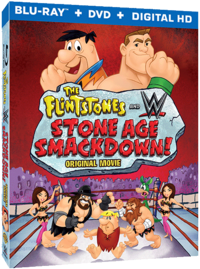 Enter to Win a Copy of The Flintstones & WWE: Stone Age SmackDown movie! a Rafflecopter giveaway Giveaway Disclosure: Only one entrant per mailing address per giveaway. If you have won the same prize on another blog, you will not be eligible to win it again. Winner is subject to eligibility verification. Open to the US and Canada only. The winner will be notified via email and will have 48 hours to reply and confirm a shipping address. This prize if offered by Warner Brothers--and A Mama's Corner of the World is not responsible for prize delivery or misdirected prizes. This giveaway is not endorsed by Facebook, Twitter, Google+, Pinterest or any other Social Media Network. As seen on Hypersweep.com! I would be Jon Cenastone! I am John Cenastone,You are courageous and stand for all that is good! Although either loved or hated, you are easily the most admired competitor in the WWE! I would be the Undertaker! Which character would you be from the film? I would be Undertaker, according to the quiz. I got that I would be Jon Cenastone. I would be the undertaker. I was The undertaker. Thanks for the giveaway! I would become John Cenastone.